Some people doesn’t like the sound of brain dishes or recipes. It make them feel gross. And when you buy fresh calf or pig’s brain in the market, the more you will feel disgusted and think that you are eating people’s brain like a zombie. Anyway, when you taste a properly prepared and cooked brain omelet dish, I’m sure you are going to love it. Cleaning the brain is the tricky part because of the delicate membrane and removing the transparent film and nerves. After that, it’s easy because you are just like cooking an egg omelet. 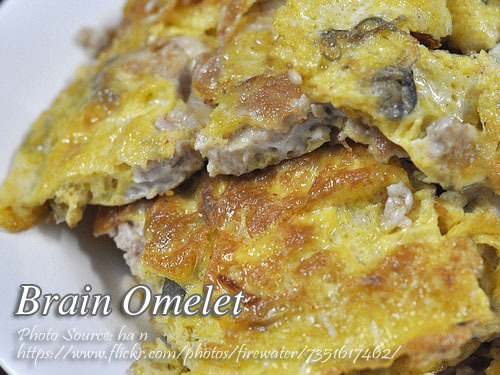 To cook brain omelet; Marinate brain, with dayap juice for at least 2 hours in refrigerator. Season with salt and pepper, then poach or steam until cooked. Cut into cubes. Heat 2 tablespoons olive oil or lard and saute garlic, onion and brain. Season to taste. Pour beaten egg over brains, fold in contents and flip. Add more oil if desired. Take care not to overcook the egg.